5 What Are The Best Hunting Binoculars for the Money? There are so many binoculars out there that it's easy to wonder just what are the best hunting binoculars. So, in this review we'll take a look at some of the best hunting binoculars for the money, considering all of the features and comparing them to the demands of hunting. In the end, price vs value was our deciding factor, with our top pick being the Bush﻿﻿nell PowerView Hunting Binoculars, which we'll explain at the end. These binoculars for hunting feature a magnification of 10x and a wide objective lens of 50mm to let in a lot of light. They come with Bushnell's instafocus technology that allows your target to instantly come into view. The BK-7 prism and multi-coated optics provide clear images with crisp details and the fold down eye cups allow for easy use when wearing eye glasses or goggles. 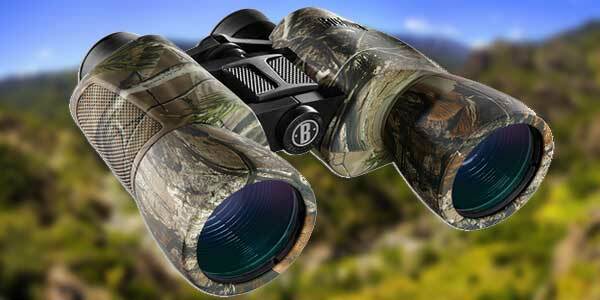 These binoculars have realtree camo rubber armor that offers protection and shock resistance. They come with a neck strap, protective carrying case, and lens caps, however, the neck strap is too thin for comfortable use in the field. They weigh just over two pounds, giving them a durable feel but requiring a steadier hand to get a clear view. Out of all buyers, 89% gave these hunting binoculars a rating of four stars or higher. Many buyers cited how easy they were to focus with the center focus bar. Many buyers also commented on how bright and clear images were. What few complaints there were centered on how the eyepieces weren't adjustable enough for them. See more of these Bushnell Hunting Binoculars... Click here. These compact hunting binoculars have a magnification of 10x and an objective lens of 25mm to provide you with versatile range of use. 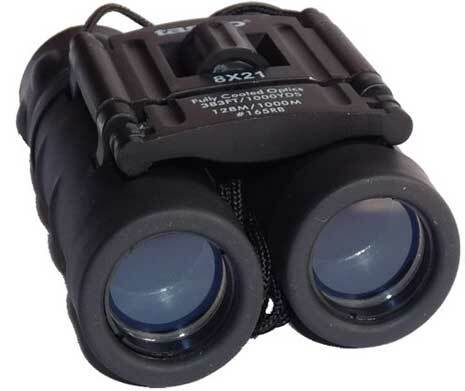 These binoculars are waterproof and fogproof and measure 4.5 inches by 4.1 inches wide. They have a durable rubber armored housing and feature lead and arsenic free eco-glass optics. With a close focus of 11.5 feet and a wide field of view (FOV) of 342 feet and a thousand yards, these compact binoculars are versatile and lend themselves well to hunting. Nikon backs these binoculars with its No Fault Lifetime Warranty (see video below), even if you're not the original owner which makes these binoculars a good investment to your hunting gear. The compact size and light weight of less than a pound won't weigh you down out in the field, and these binoculars are small enough to fit in your pocket or field bag. These binoculars offer great clarity and have a good telescoping eye relief, making them comfortable and usable for those who wear eye glasses. Out of all the buyers, 95% of buyers gave these binoculars a rating of four stars or higher, with 82% of buyers ranking them five stars. The compact size and light weight are some of the highest complimented features. A few buyers thought that these were a little too light and that while they could hold them steady they didn't feel as sturdy as heavier binoculars tend to feel. These binoculars have Mossy Oak Treestand camo on the rubber armored housing to compliment your gear and provide you the stealth needed out in the woods. They have a magnification of 10x and an objective lens of 42mm to provide a clear image in lower lighting. 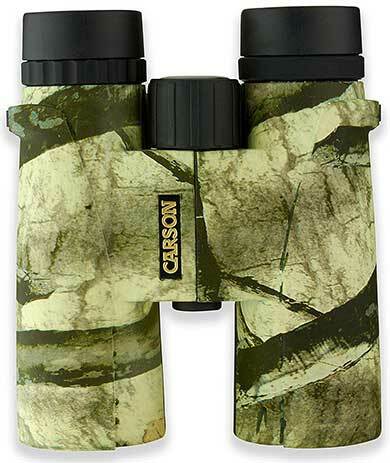 At only 5.9 inches long and weighing 24 ounces, these are sturdier than compact hunting binoculars but won't be cumbersome or weigh you down. BK-4 prisms provide excellent image clarity, while the nitrogen purged rubber armored housing make these binoculars rugged and able to handle whatever Mother Nature throws at them. Extra-long eye relief make these comfortable to use for those who wear eye glasses. Rubberized lens cap hang free to allow for easier attaching. The focus knob turns easily, though some users may wish it had a stiffer turn. 80% of all buyers gave these hunting binoculars a rating of four stars or higher. Many buyers commented on the great optics for the price, as well as the sleek design and great camo finish. What few complaints there were came down to the focus mechanism, with a few buyers having difficulty getting them to focus properly for their eyes. Others commented that they thought the optics should be better for the price. See more of the Carson Caribou... Click here. These hunting binoculars offer a lot of value for the price. They have a magnification of 12x and an objective lens of 25mm. 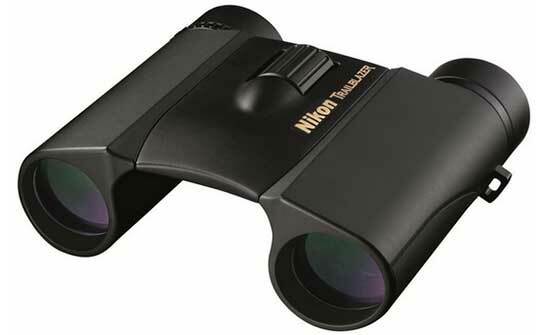 These are a compact and lightweight binoculars that fold up small and weigh only 12 ounces. They feature a roof prism and fully coated optics. The rubber armored housing provides shock resistance and adds durability to a pair of binoculars that should perform for years despite costing under $20. It's hard to get past the price of these binoculars, but the optics produce crisp images of higher quality than you would expect. They fold up nice and tight to allow for easy storage in a pocket or bag. While they are durable, weather resistant, and should perform well for years, if something should happen to them it won't be that big of a loss. The field of view of 240 feet at a thousand yards provides a good view with just enough details. These binoculars are not waterproof or fogproof. 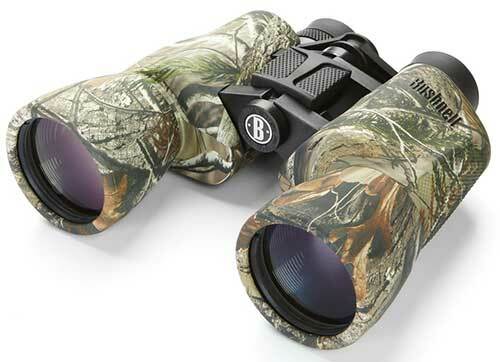 78% of total buyers gave these compact hunting binoculars a rating of four stars or higher. Buyers loved the compact size, the great price, and how they folded up entirely. Many were surprised at how crisp the images were and how far out they were able to see clearly. The eye relief was cited as not being the best and that focus at long distances left much to be desired, however, all complaints were qualified that for the price you really can't go wrong with these binoculars. What Are The Best Hunting Binoculars for the Money? As you can see, there's a lot of variation in features when trying to find the best hunting binocular for the money. We looked at a lot of models and decided upon these four as being the best bang for your buck. But, we had to go with the Bushnell PowerView Hunting Binoculars as our number one choice. With a list price under $100 with considerable discounts available, the amount of value packed into the binoculars is only impressive. We especially liked the ease of focusing and image quality, two of the most important features when it comes to any binoculars. Click here to buy the Bushnell Powerview on Amazon.